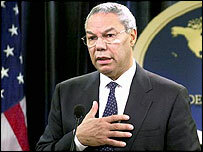 US Secretary of State Colin Powell has applied for a coat of arms to mark his Scottish ancestry. The world's most famous soldier has applied to the Court of Lord Lyon in Edinburgh for the arms. The law allows him to apply on behalf of his father, born a citizen of the Crown in Jamaica, although his Scottish roots are on his mother's side. The coat of arms, if granted, will incorporate the crest of an American bald eagle. The eagle is both America's national emblem and the symbol of the 101st Airborne Division in which Mr Powell served. The retired four-star general's military background will also be symbolised by a shield with four stars and crossed swords. The Heraldry Society of Scotland has helped Mr Powell with the design. The birthplace of Mr Powell's father Luther could entitle the family to an English or Scottish coat of arms. But it is understood Mr Powell chose to apply for the latter, to mark his mother Maud McKoy's ancestry. The Court of the Lord Lyon, Scotland's heraldic authority, establishes rights to arms and pedigrees. Lyon Clerk Elizabeth Roads said a decision on Mr Powell's application was yet to be made. "If approved the grant will go to his father and the coat of arms can be by used by his father's descendants," she said. Earlier this year, Scottish author Allan Morrison claimed Elvis Presley's roots could be traced to Aberdeenshire village Lonmay. How long will Powell soldier on?